Ze Rostam cho beshenid esfandiyaar.Bekhandeed shaadaan cho khorram bahaar (when Esfandiyaar heard the call of Rostam, he mocked with a smile that resembled a flowering spring),” Aqa Boman Kohinoor gushes eloquently. His passion transported us to his ancient motherland as he prophetically narrated from Iran’s national poet Ferdowsi’s epical Shahnameh, the war tale of Rostam the great and warrior prince Esfandiyaar. “I believe in all forms of love. It keeps me going,” smiles Boman, India’s ambassador of Persian culture, at his restaurant Britannia & Co in Mumbai’s Ballard Pier commercial hub. 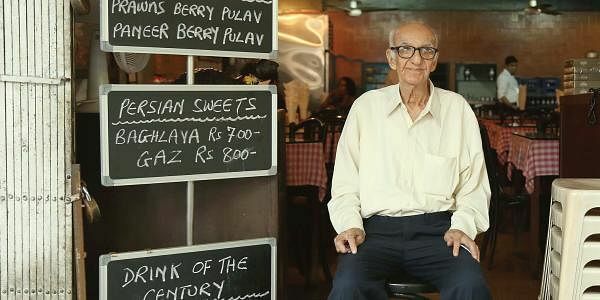 Established by his father Aqa Rashid Kohinoor in 1923, a Zarthusti Irani immigrant from Yazd in Iran, Britannia is India’s pioneering Persian restaurant. Unlike the typical Irani cafés of chai and bun maska fame, Britannia has been celebrated for introducing authentic Persian and Parsi flavours to the Indian palate. While their dhansaak, a Parsi rice delicacy with rich dal, meat, eggs or vegetables is a landmark in Zoroastrian cuisine, Britannia’s legendary ‘custard’ (Parsi for Créme Brulee) is mouth-melting manna. Traditional Iranian sweets such as gaz shirin (Persian nougat) and baklava (pronounced ‘baaghlavaa’) are souvenirs from Persia’s culinary treasure. Sprightly and table-hopping at 93 and taking orders from his international guests, ‘Aqa’ ( ‘sir’ in Persian) as he is affectionately known, is loved and adored as is his culinary legacy. “After working around the world, discovering cuisines is my job, this is something I have never come across before,” says Seamus, an Irish chef after his first helping of the signature zereshk polo, an exotic Iranian rice delicacy with original Persian barberries from Tehran, nuts, marble-size kebabs, saffron and gravy.